Glowing in the light, the real zari catching each moment in timeless warp and weft,thearray of coloursso vibrant that its beauty can hold your attention for hours, the patternstelling a story so unique, and compelling. The Indiansaree is not a mere garment. Its length denotes the culture it comes, in fact it is the continuation of an artistry steeped in the past. Thus in India, a bridal trousseau must hold some of these gorgeous beauties created by weavers , to give the bride a grandentry into her new life, confident in the fact that she holds in her multitude bags , one of the finest cultural treasures. For long, the preparation of a trousseau has been the domain of mothers who would lovingly picksarees for their daughters, and this would happen, as and when they would come across and exquisite piece. In the more recent times, with daughters of the house stepping out into the professional world, with as much gusto as the sons, there isn’t a lot of time available to carry out the trousseau buying. The value of the trousseau, in termsof the sarees it has, in fact has not reduced despite all the fear of over modernity and westernized cultural impact that we keep harping about. For those in abit of hurry here are my mostpreferred picks for the trousseau, not because these are expensive drapes, but because theytell astory of enduring creativity, a saga of a much loved craft that reflects the richness of the culture it denotes with shining brilliance. Hard to miss amongst the arena filled with exceptionallybeautifulsareesfrom Bengal, the Baluchari from the Bankura district shows off the immaculate weaving styles of the artisans in the pallu that has an episode from the Ramayana or the Mahabharata clearly woven into it. The silk is soft, the colours vibrant to light and the sheen of thereshamweave is dramatic to say the least. Originally, the sarees would have the depiction of Gods and Goddesses from the Bishnupur district of Bankura in West Bengal, but it gained maximum fame through the story of Mahabharata and Ramayana, that the weaves today more commonly depict. It’s true that this is one weave whose history goes back almost a millennium. The word katan though simply means silk and has one of the most prestigious histories that any weave can ever possess. Resurrected over centuries by different rulers, the saree comes with motifs in ameenakari style worked on silver or gold zari. The pallu is heavily worked and can be the highlight of the saree while the booties or paisleys remain its predominant design. 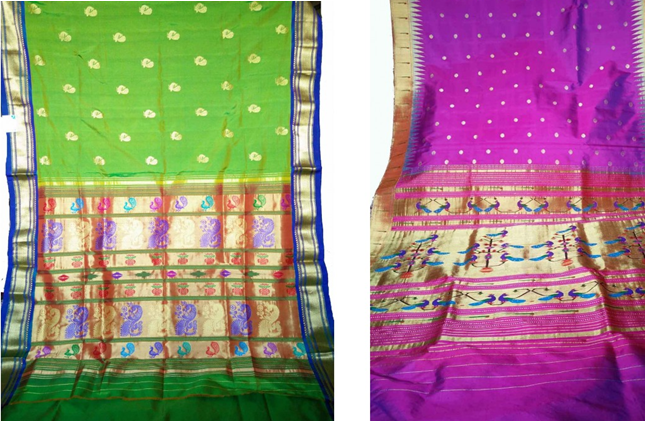 The Silk could also come in patola weave with multicolored thread work. The bride could pick the softest silks for a winter wedding or the lightest tissue weaves for a wedding in summer. Till today in marriages in north India and Bengal, the bride is usually draped in a Banarasi. It is pure opulence steeped in history. The one given here is a Katan Jamdani with the mahapaar-or abroad border that adds a sense of grandeur to the look of any bride. 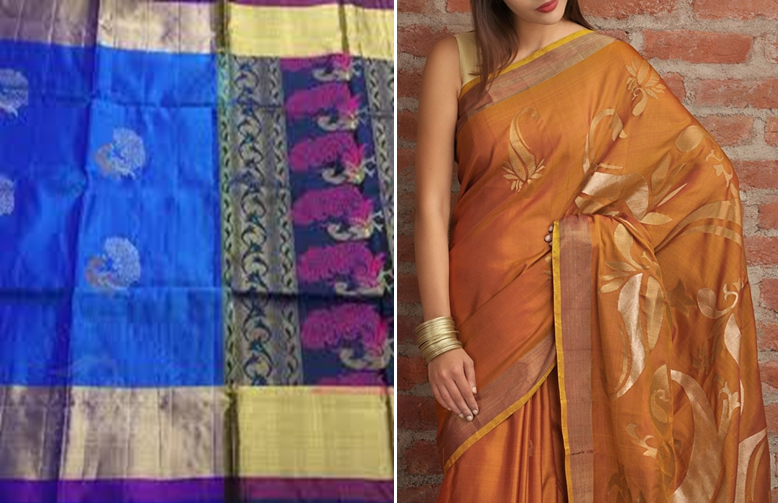 Though today, the Uppada sarees are best seen in both Andhra Pradesh and Tamil Nadu, the floral motifs along with birds and other nature related motifs are all part of an ancient tradition of weaving that co-existed in the east as well. 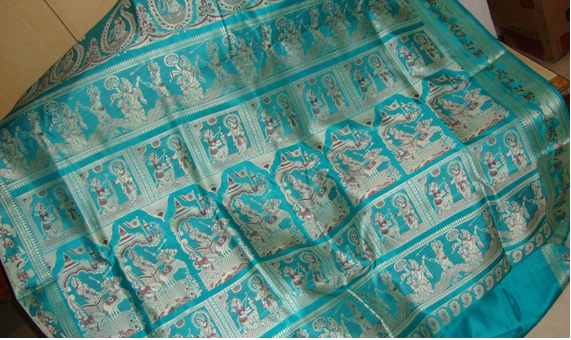 It was under the influence of the Muslim rulers in Bengal that jamdani as a weaving style got popular. It’s a Persian style of weaving and it impacted the orginal Uppadas to create something truly unique, making them one of the most coveted of sarees in any bride’s trousseau. Here are two-one with the most popular of patterns, the peacock and the other with large leaves and floral designs. Perhaps the holy grail of all weaving forms, the Paithani style dates back to 200BC and has survived the modern influx of cheaper silks because of the sheer brilliance of its 900 bootis and the shine and sheen on the silk that seldom can be matched by other weaves.The Paithani was also patronized by Aurangzeb when the Mughals ruled over the present areas of Yeola and Aurangabad. The saree is woven in silk and real gold or silver zari, though now it is more of silk resham work that is a popular variant. 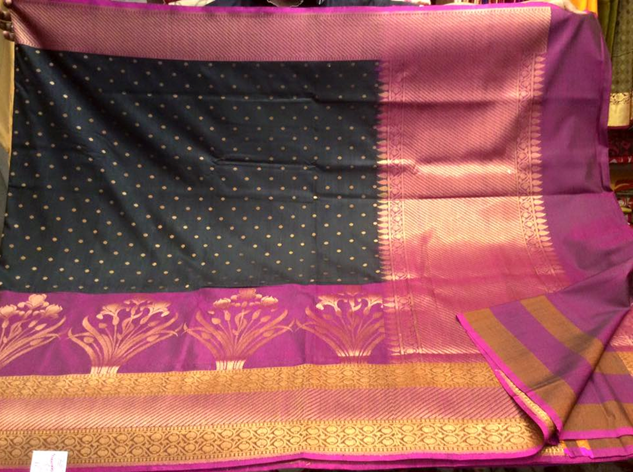 One of the most revered sarees considered fit enough for the deity to adorn –the Kanjeevaram or the Kanchipuram even today is used to bedeck Goddess Meenakshi and is looked upon an auspicious saree to have in the trousseau. The grand Kanjeevaram is a tale of India’s golden past when silks were worn by royalty and the upper caste.Today, a Kanjeevaram sell at all shops of repute and has become the symbol of India’s great weaving heritage. 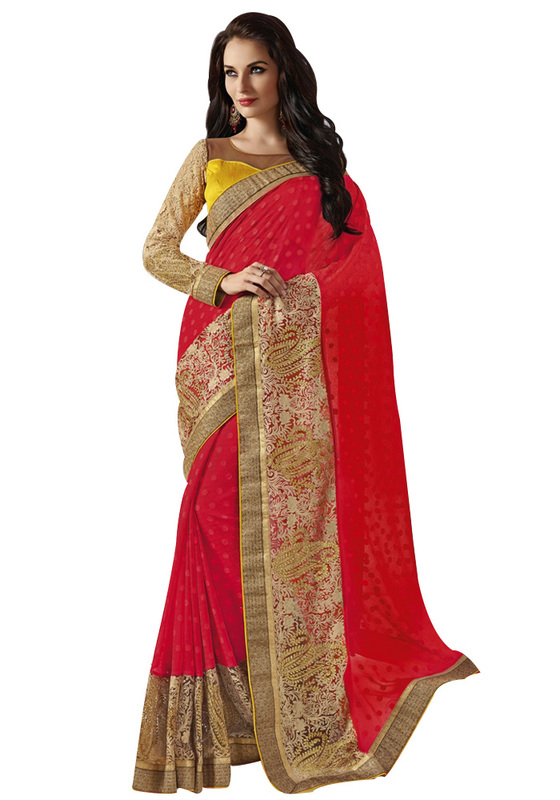 The saree has bold colors, striking contrast borders, real zari work all over, and can be bought as per the weight of silk! Yes, notorious for their weight,some of the heavy silks worn by celebrities weigh as much as 2 kgs! If you can ever imagine that the six month long weaving that a Kanjeevaram needs, could be overtaken by any other kind of saree, then it has got to be the Patan Patola saree from Gujarat. This double Ikatsaree is loved for its intricate weave, the stylish and contemporary usage of colour palettes, and the smart silhouettes that it can create. The weaves look geometric, hiding the motifs of parrots, peacocks, flowers and plants of all kinds within. The fact still remains that even till date the finest patolas are still woven by three families who guard the secret of this weaving style making them one of the most sought after sarees. Belonging to the town of Chanderi in Madhya Pradesh, this saree from the heart of India truly encompasses the best of both yarns, as it is asaree in a mix of silk and cotton, making it an ideal choice for summer weddings. A glossy sheen fabric and the broad border can indeed make its pale colours look ethereal. Though the original weaving was done by the Muslim weavers in the more ancient past, but in the 14th century the Koshti weavers from Jhansi moved to Chanderi and settled there to practice this art of weaving. Coin designs, floral patterns and geometric symbols are woven with care intoone of the most gossamer of Indian fabrics. A trousseau reflects the bride’s aesthetics more than anything else and with this treasure trove of the finest ion Indian sarees, the contemporary bride is bound to put her best foot forward into a brand new chapter of her life.